This dill pickle popcorn is tangy, salty and savoury, and the perfect way to satisfy a craving in a much healthier way! 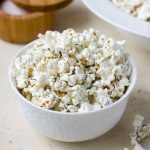 Popcorn is one of my favourite snacks; it’s super simple to make, and can easily satisfy a crunchy, salty or savoury craving. Although it’s got a bit of a bad reputation, not all popcorn is created equal. Yes, the stuff at the movie theatre is delicious, but it’s also covered in vegetable oil and too many additives to list, however, when made at home popcorn is a highly underrated and nutritious snack. Not only is it simple to whip up on the stove top, but plain or natural popcorn in microwavable bags is becoming easier and easier to find, and is a great shortcut if you don’t feel like popping the kernels yourself. But, to me, the best part about popcorn is the toppings; by simply combining some herbs and spices you can easily create any sweet or savoury flavour you like. Of all of the flavours, dill pickle is one of my personal favourites and, after polling you all on Instagram, it appears it is one of yours too! 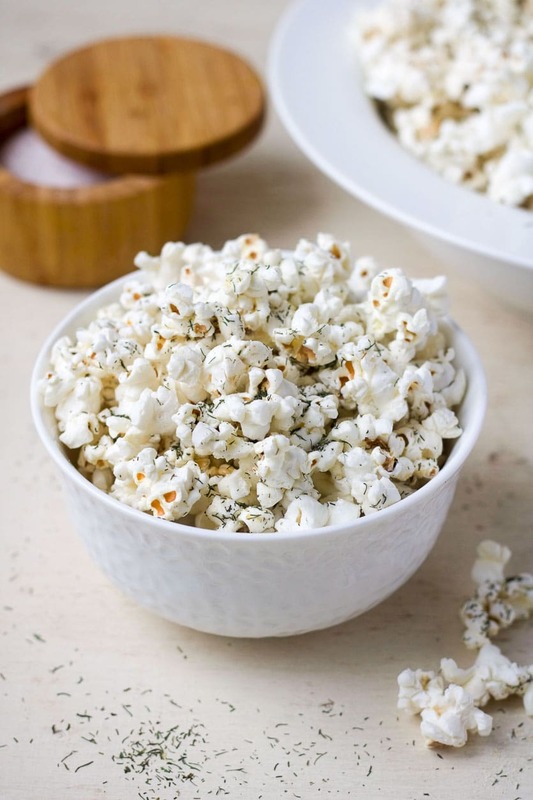 This dill pickle popcorn is salty and savoury and everything in between, and the perfect movie night snack that you can feel good about eating since it is just as good for you. This dill pickle popcorn seasoning is quick and simple to prepare. If you want to make it in advance, simply double or triple the recipe to make a larger batch and store it in a glass jar or container in the pantry until needed. Heat 2 tablespoons of butter in a heavy bottom pot on medium heat and allow to melt. While the popcorn is popping, combine all of the spices in a small bowl or jar and set aside. Melt the remaining 2 tablespoons of butter in a small saucepan or dish in the microwave and set aside. Once the popcorn is ready, drizzle with melted butter and sprinkle with dill pickle seasoning to your liking.